Expat Life with Chickenruby: A UK Family Wedding and a year of travel. Apart from a week in September and a stop over this Wednesday, I've not been back in Dubai since May, so I've been taking a break from the construction photography, although Peter has been taking weekly photo's of the metro stations for me, the glass panels are going on now. I've been travelling a lot over the summer, Northern Ireland, Germany, Greece and South Africa visiting family and friends and it's lovely to be back in the UK for our 3rd and final wedding of the year. Sadly we've also had 3 funerals this year, my SIL, my uncle and Peter's uncle also, but 2018 will be remembered for the weddings as well. Our eldest son got married in June, best friends in July and our niece yesterday. Whilst I'm looking forward to returning to Dubai in a week or two, I'm really going to miss the UK as my next visit isn't until March 2019. My mother is joining us in Dubai for Christmas also, but that's not the end of my travels for this year, we're going to Cairo in November and back to South Africa in December. Prepared for all weathers and the reception was in a field. 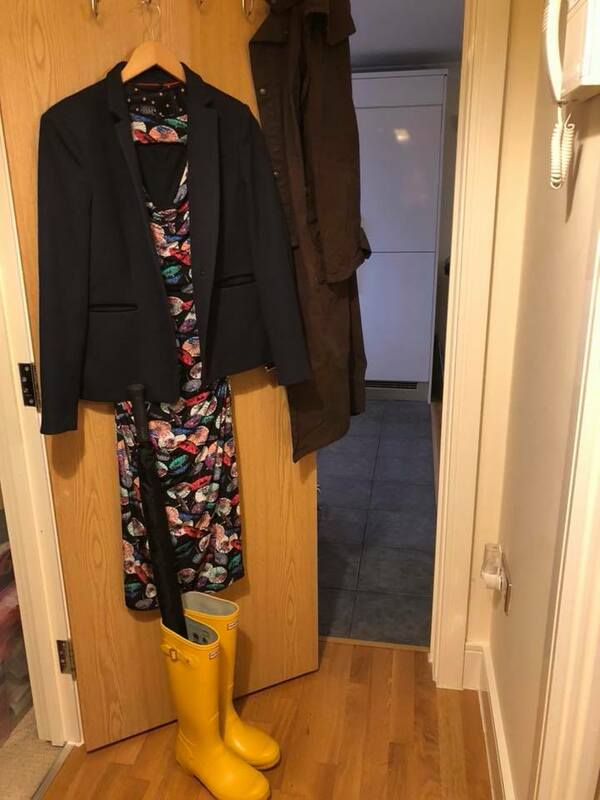 If you look closely at the dress, it's covered with umbrellas. My Sunday Photo's for 2018. Week 190 Greece Just how instagramable is it? well over a year, I wonder if you will see any changes in that time here? My guess is nothing like being away for Dubai for a few months. I love those wellies. I hope it was a lovely wedding. It will be nice to have your mum over in Dubai for Christmas. That is an exceptional wedding outfit! Wouldn't suit me, but you certainly seem prepared, and have the appropriate measure of glamour. I've loved following your travels this year, looking forward to Cairo. Love the idea of a wedding in a field. Hi Suzanne, you have been a busy little travel bug this year! You'll have just enough time back in Dubai to unpack and repack. I do like yesterdays wedding outfit, there's nothing like a nice pair of wellies to add a little ohlala to an outfit. You really have done a lot of travelling!